Luckily, nobody was really hurt. But you can imagine that this can end badly, so don’t try that! The gas is called ‘Faulgas‘ and is mostly Methane. When the lake is froze, it can build smaller and larger bubbles under the ice. Impressive, but dangerous: don’t play with gas! 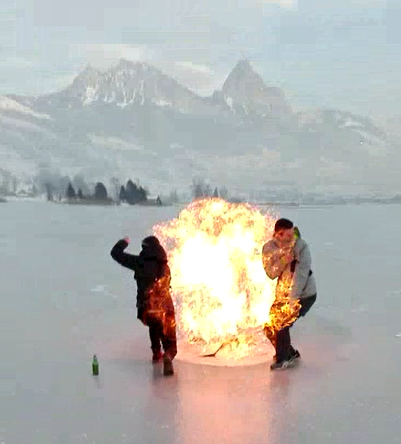 This entry was posted in Pictures, Switzerland and tagged Burning Gas, Explosion, Fire, Frozen Lake, Ice, Lauerz, Methan, Switzerland by Erich Styger. Bookmark the permalink. I think taking a gas BBQ out there and attaching a hose to the gas would be on the cards if this happened in Australia. I am sure you have heard of people lighting their own human produced methane. This seems similar in that people are lighting “lake farts”.